The December onwards update of our What’s On in Warwick at a Glance has now been posted online. It is a long-term comprehensive list of events in the town including concerts, talks, plays, Warwick Races, and community gatherings such as our monthly socials ‘In the Ballroom’ and Tea and Dance Lessons. Just click on the link on the Home Page and voila! 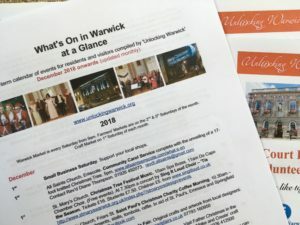 If you are planning a public event in the town, send the details to whatson@unlockingwarwick.org well in advance; the What’s On in Warwick is updated only once a month.